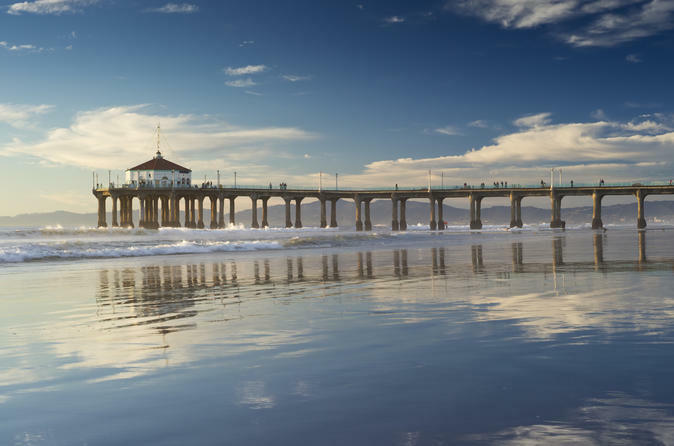 Experience Southern California’s laid-back beach lifestyle, and see various Pacific coast beaches on this day trip from Los Angeles! Visit Huntington Beach, Long Beach, and climb aboard the Queen Mary, the famous ocean liner. See the colorful characters and performers of Venice Beach, and ride the roller coasters at Santa Monica Pier. An enthralling day at the beach awaits! Get a taste of the famously laid-back, Southern California lifestyle on this tour of the West Coast's most famous beachside attractions! First, you’ll head to Huntington Beach, the so-called “Surf City” made popular by the Beach Boys. See surfers paddling in the ocean, and take in some beach volleyball action. Wriggle your toes in the sand before heading north to Long Beach. In Long Beach, you’ll have a behind-the-scenes tour of one of the most famous ships in the world, the British ocean liner RMS Queen Mary. This legendary cruise ship made its last voyage in 1967, and now it serves as a monument to the days of transatlantic pleasure cruises. See the restored sections of the ship such as her bridge, the aft, machine rooms and much more! After you’ve seen the Queen Mary’s elegant facilities, you’ll travel to one of the most famously eclectic and eccentric stretches of coast in the world, Venice Beach. In Venice, you’ll see street performers, bazaar merchants, muscle-bound weightlifters, and skateboarders, all of whom contribute to Venice Beach’s signature vibe. After you’ve seen Venice’s wonderful weirdness, you’ll head to the Santa Monica Pier, where you can dine, people watch, or ride the thrilling coasters and Ferris wheel at Pacific Park. Your trip concludes at the Third Street Promenade, a popular beach-friendly, pedestrian-only boulevard. Dust off the sand and shop to your heart's content before returning to your air-conditioned coach to Los Angeles.